The smartest shades in the world? 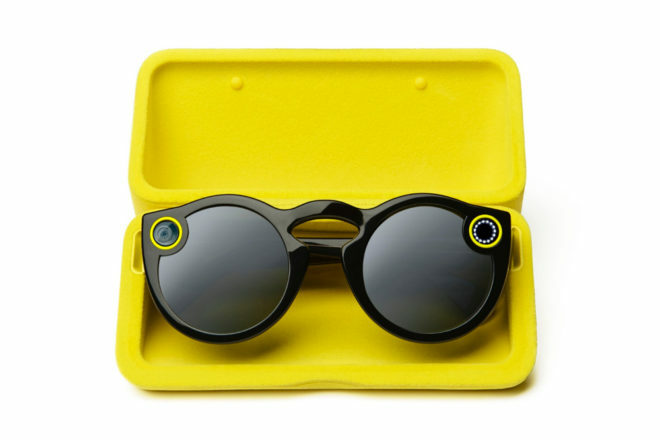 Snap, Inc spectacles that record. Cool or creepy? Are these futuristic recording glasses the ultimate cool accessory to sport or just incredibly creepy? It wasn’t long ago that Google was trying to usher in an age when you could record what you were looking at in an image or video by simply using a nerdy-looking device on your face to do so. Unfortunately, Google’s augmented reality Glass headset not only looked a bit daft, like a prop from Star Trek: The Next Generation, but it was creepy too; no one could tell when you were secretly recording them. Hence Glass wearers becoming known as ‘Glassholes’. They were also obscenely expensive: $1589 (really?). But where Google failed, Snapchat (now Snap, Inc.) looks set to succeed with its Spectacles. Recently, a strange yellow vending machine called Snapbot has been cropping up at random locations in the States, like Venice Beach in Los Angeles (you can find its latest location via its website spectacles.com), dispensing the Spectacles, which have been made to look like a normal pair of shades, for a very reasonable US$129 ($174). The only oddity are the two yellow-ringed dots at the top of each lens. One becomes a glowing circle of white light to let people know you’re recording, and the other is a lens. Simply ‘tap to snap’: tap a button on the frame to start recording a 10-second clip, which is sent to your phone to be uploaded to Snapchat Memories. Currently on a very limited release, Snap, Inc.’s approach seems to be working, with word of mouth coming from users rather than the press. And enterprising American lensmakers are now offering prescription lenses for Spectacles, making them perfect for social-media butterflies with less than 20-20 vision. There’s no confirmation yet on when these might be coming to Australian shores but we can’t wait to get our hands on them to see if it means the end of the smartphone when it comes to capturing and sharing your travels. And word is Apple is working on a pair of specs too. The future’s so bright it seems, that you’ve gotta wear shades. Find out…What’s trending in travel right now?